It’s about time I wrote about a goalkeeper and Kazeem Yekeen, the regular goalkeeper of Kwara United FC in the Nigeria Premier League, is first one out. From my point of view, Yekeen is the most interesting goalkeeper in the Nigeria Premier League 2010-2011, although most experts would probably disagree and point to Akpan Bassey (Heartland FC – born 06.01.1984), Sunday Rotimi (Dolphins FC – born 08.03.1980), Joel Afelokhai Theophilus (Kano Pillars FC – born 07.04.1988), Olufemi Thomas (Ocean Boys FC – born 05.08.1989), Okiemute Odah (Sharks FC – born 23.11.1988), Laide Okanlawon (Shooting Stars FC – born 31.12.1990) or Chigozie Agbim (Warri Wolves FC – born 28.11.1984). 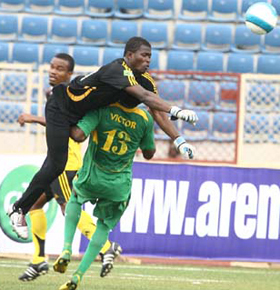 Kazeem Yekeen started his football career at Sokoto United FC, an amateur club from the extreme northwest of Nigeria. In 2009, Yekeen moved to Ilorin and signed a professional contract with the ambitious side Kwara United FC. In the summer of 2009, Yekeen was included in the squad of the Nigeria U-17 national football team. In August 2009, it was reported that fifteen players from the squad had been dropped from the team after failing an age test. Yekeen was one of the players retained according to several reports. However, in a later interview with Complete Sports Nigeria, Yekeen has lamented the age test which apparently disqualified him from the Nigeria U-17 national football team. Based on the above, the facts are somewhat unclear regarding the age test and the real age of Yekeen. According to the Facebook-page of Yekeen, he is born 01.12.1992, which I find probable and have no reason to distrust. This would make Yekeen 18 years old and this is also why I have previously written that I “personally cannot understand why the talented goalkeeper Kazeem Yekeen is not included in the Nigeria U-20 national football team”. Yekeen is a regular player for one of the best teams in Nigeria, but John Obuh, the coach of the Nigeria U-20 national football team, decided for Gideon Gambo (born 15.11.1992) of Sharks FC, who hardly gets any action at his club Sharks FC because of the brilliance of Okiemute Odah. As far as I know, Yekeen forced his way into the first team of Kwara United FC during the Nigeria Premier League 2009-2010, although facing tough competition from Mustapha Salihu (born 01.12.1987), a former member of the Nigeria B, the Nigeria U-23 and the Nigeria U-17 national football team. Despite some good matches during the season, it was mainly the “Super Four 2010”, a season opening tournament between the four top teams of the Nigeria Premier League 2009-2010, that made Yekeen known to Nigerian football fans. Yekeen made some excellent performances and got some headlines in local media, which obviously top club Kano Pillars FC noticed. Kano Pillars FC was apparently trying to sign the player before the Nigeria Premier League 2010-2011. However, Yekeen decided to stay with Kwara United FC and has made a brilliant start to the Nigeria Premier League 2010-2011. Yekeen was named in the official “Team of the week” after Round 18. At the time of writing, Kwara United FC has only conceded 15 goals in 21 league matches, much because of the agile goalkeeping of the youngster. Yekeen has also recently been interviewed by the Daily Independent. He explained that he had been working hard in training as well as individually to improve his goalkeeping skills. His personal goal is to keep 13 clean sheets during the second round of the season. The name of Yekeen is written in several ways, including “Kareem Yekeen”, “Kazeem Yekini” and “Kassim Yekeen”. Kazeem Yekeen is the name he uses on his own Facebook-page. In most football circles, it is common knowledge that Africa seems to lack the ability to produce fine goalkeepers. From my point of view, this is only partly true. There are several young, promising goalkeepers from the five countries I write about and Kazeem Yekeen of Nigeria is obviously a player to follow closely for the coming years. The picture of Yekeen in action is taken from MTN Football.